AIDS outed Jeff Schmalz. A rising star at The New York Times, Jeff had carefully kept his identity as a gay man hidden from his superiors to protect his career. But everything changed on December 21, 1990 when he collapsed in the newsroom and was then diagnosed with full-blown AIDS. Courageously, Jeff chose to report on the disease that was killing him and countless others. 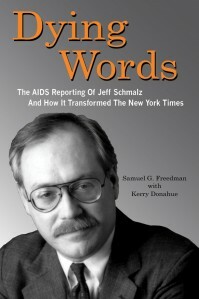 Dying Words is based on original interviews with Anna Quindlen, Arthur Sulzberger, Jr. and Adam Moss, among other leading journalists, and it draws on Jeff’s own interviews with such figures as Bill Clinton, Magic Johnson, Mary Fisher, Larry Kramer, and Randy Shilts. This book—and a companion radio documentary available through PRX—preserve Jeff Schmalz’s legacy and confirm his profound effect on American journalism. Samuel G. Freedman is an award-winning author, journalist, and professor. A columnist for The New York Times and a professor at Columbia University, he is the author of seven acclaimed books. A National Book Award and Pulitzer Prize finalist, he has won the Helen Bernstein Award for Excellence in Journalism and the National Jewish Book Award. Kerry Donahue is director of the radio program at Columbia Journalism School. A former executive producer at WNYC, her work has also been heard on PRI, PRX, NPR, WNYC, WBGO, and Marketplace. She was an early podcast pioneer in her role as a producer of original content at Audible.com.